Do you experience difficulties with the process of window washing around your property? Your efforts are not enough to remove stains, water streaks and dirt from glass surfaces? The experts of window washing in Barnsbury will help you out! Say goodbye to the endless hours of polishing and wiping – the skilled and experienced team will handle this matter. You will be able to enjoy your free time – just let us do this time-consuming and tedious task for you. Our professional approach will grant you lots of bonuses. We also provide our professional services in nearby areas: Islington, Caledonian Road, Holloway, Lower Holloway, Highbury. You can always count on our workmanship and devotion for domestic and commercial window cleaning. 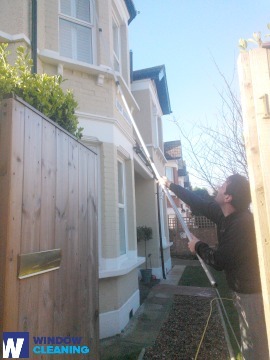 Our experience allows us to clean all types of windows you could possibly have as part of your property. For instance, you can book cleaning of single or double windows, French doors, sash windows, patio doors and bay windows. Besides that, we include greenhouses and skylights as part of our practice. So to speak, you can fully enjoy the good look of your windows with our prompt and reliable services. You can enjoy perfectly looking work environment with the help of the specialists of commercial window cleaning. You can count on our high end services for all kinds of business premises. For instance, if you have a small shop, we can carefully polish its windows by using our water fed extension pole equipment – it allows us to as high as the fourth floor. If you search for flawless look for the glass panes of a skyscraper in London and the neighbouring areas, we will make use of our rope access tools. In both cases, you will appreciate superb results in no time. We use the most exceptional methods to be sure that you take advantage of the best window cleaning. With our water-fed extension pole cleaning system and high pressure cleaning technique, you will enjoy spotless look of your windows. We connect our poles to water supply devices in our vans to make sure that there is no danger for the exterior of your dwelling or business premise. For high-rise windows, we utilise entirely secured rope access technique. You can profit from these cleaning techniques now – just ring 020 3746 3113! You will see your sparkly clean home after the expert window cleaners in Barnsbury finish their work. We deliver superb services for the entire London locality. The most advanced techniques are included in our working practice – including water-fed extension pole system and and jet washing. You will surely see the change in your home – we use purified water for the process of inside/outside window washing. Call us today on 020 3746 3113. Our customer agents will help you and answer your questions. Or you can use our on-site booking from. The nearest tube station serving N1 Barnsbury is Highbury & Islington.